Let me help you prepare for the obedience ring. Or just get some more precision with your obedience exercises. The Novice class is for Beginner Dogs. We will be working on retrieving as well as other open exercises. This session will give you new and fresh ideas on how to teach the open and utility exercises... Help your dog learn the exercises not the routine. I will help you teach all the individual pieces to each exercise. Discussion of rules and run throughs. Introduction to Rally... Have fun with a little spin on obedience.... 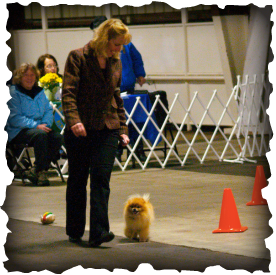 Your dog has to have some attention heeling as well as knowing both his finishes. This class will get you started in rally teaching you both the finishes, as well as all the Novice signs... The first half of the class will be in working on the skills needed to complete a rally course. The second half of the class will be practicing a rally course as well as talking about the rules and the correct way stations are to be performed. Learn the advanced obedience skills in this six week course... You will learn all of the advanced and excellent rally signs and how to execute them. The second half of each class we will be doing run throughs and learn the rules for these levels.